This recipe was inspired by a CSA I belonged to while living in Vermont. Dwight Miller Orchards presses cider and makes their own apple cider vinegar. This time of the year they include both items in their weekly share pick-up. It’s become a favorite dish that I make every Fall. It also makes a tempting new dish to try on your Thanksgiving menu. Sort and rinse wheat berries. Place in heavy sauce pan and add water and apple cider. Soak overnight or for 6-8 hours. Bring to a boil over high heat, then reduce heat, cover, and simmer for 1 hour. If any liquid remains, instead of draining, simmer with the lid off for a few additional minutes (you don’t want to lose any of the apple cider flavor). 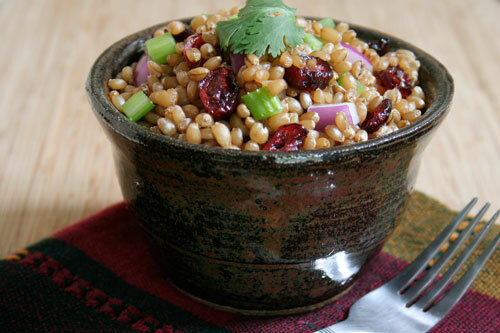 Immediately after cooking toss the cranberries with the warm wheat berries. Set aside and let cool. 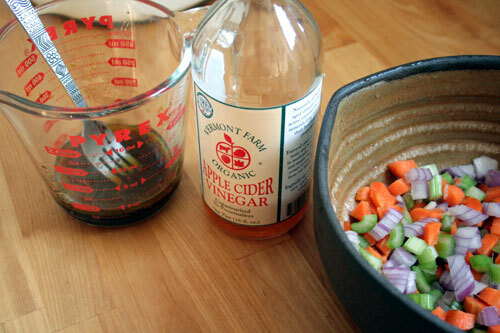 While wheat berries are cooking dice the celery, carrots and red onion and toss together in a large bowl. If using, add walnuts. 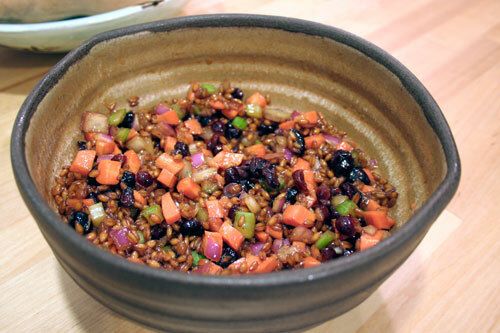 Add the cooled wheat berry/cranberry mix to the vegetables and toss to combine. Drizzle with the dressing and mix well. Serve immediately or refrigerate for up to 2 days.